Over the last decade blogging and other social media has become a part of most of our lives. This surge has been seen in the science community too. Platforms like freethoughtblogs, home to PZ Myers' blog Pharyngula, New Zealand's own sciblogs exemplify this growth. It has got to a point where you need to have an online presence to be noticed. I have taken this route too. I have a blog (obviously) and I have a twitter account as of this week. Social media has been a hugely positive for science. Disseminating of ideas and new discoveries can be notoriously slow in the scientific literature, particularly in high impact journals that receive literally hundreds of submissions from hopeful scientists every day. Social media and blogging on the other hand allows rapid sharing of ideas, and in recent times it has been the vehicle of criticism. There are two notable examples that come to mind although I am sure there are many others: (1) the famous 'arsenic-life' paper, and (2) the 'velvet worm--insect hybrid' paper. The first example, 'arsenic life', exploded in the scientific blogging community. A Google search of arsenic life yields 11,300,000 hits. The original work was published in one of the most prominent journals, Science, but was preceded by a press release by NASA who funded the research. The press release was tantalizing and alluded to the discovery of extraterrestrial life. This was not the case. What the research apparently showed was that bacteria, named GFAJ-1, was not only growing in high levels or arsenic, but actually incorporating arsenate into it's DNA 'backbone'. This is significant because all life on Earth as we knew it until then used phosphate in it's DNA backbone--GFAJ-1 was essentially replacing phosphate with arsenate. Unsurprisingly, such a bold claim is always approached with skepticism in the science community. However, this work was met with more than just skepticism. It was met with disbelief and harsh criticism. I have taken the time to Google that for you, all you need to do is click here to see the results. In fact about six months later Science published no less than eight technical comments on the original arsenic life paper along with a reply from the original authors. However, it was blogging that started it all. Probably the most outspoken and prominent critics was Rosie Redfield. Rosie is now trying to reproduce the results of the arsenic life paper with a live diary of her progress. To date she has been unable to replicate the growth reported by Wolfe-Simon et al. (arsenic life). We are left with several different conclusions we can draw thus far. One of them is clearly that Wolfe-Simon et al are did something dodgy. Another is that Rosie Redfield is doing something different that is inhibiting the growth of GFAJ-1 in her arsenate medium. Because Rosie is live blogging her progress and getting advice from readers the second seems unlikely, but who knows. None the less, it is an excellent example of a scientist using social media to improve science in general. The second example is a paper by Donald I. Williamson published in another high impact journal, the Proceedings of the National Academy of Science. The paper proposed a bold new idea that Williamson claimed would change the way we should view evolution. He claimed that holometabolous species (e.g. butterflies) are not decedents of a single lineage, but rather the result of an ancient hybridization between two lineages; one that resembles the larval form and one that resembles the adult form. The example that Williamson put forward in his 2009 paper was Lepidoptera.Williamson claimed that the two distinct forms that butterflies and moths take in their life cycle (i.e. 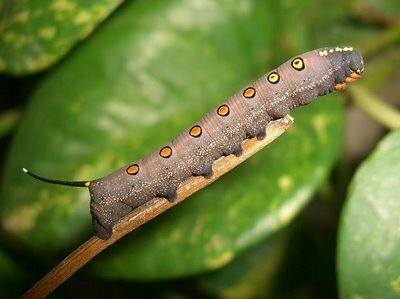 caterpillar and flying adult) resulted from the 'unholy matrimony' between a velvet worm and an butterfly or moth-like insect. To the casual observer this might sound crazy, but at the same time wonderfully appealing. In fact, looking at a caterpillar it might be easy to believe that they are more closely related to velvet worms than butterflies. See the picture below. However, there are several lines of argument along with empirical evidence that demonstrates that caterpillars and butterflies are indeed one lineage separate from velvet worms. This evidence was presented by several authors in follow-up commentary published in PNAS that severely criticised Williamson's work. See here and here. The formal criticisms published in PNAS are an example of science in working and PNAS should be applauded for this. However, the biggest question that should be asked is, how was this work published in the first place given the significant flaws? This was discussed and debated heavily online and it was the online science community that really got people interested in making formal comments. My favourite quote from an online source is from Fred Nijhout saying that the paper would be better suited to "National Enquirer than [PNAS]." Social media are becoming increasingly important as ways of promoting and even accessing scientific literature, as well as tools for criticism. I find it impossible to keep on top of the new literature coming out. Blogs of interesting research are one of the ways I find relevant material that might have otherwise slipped under my radar (read: Google Scholar alerts). There's also an interesting TED talk that's relevant - Michael Nielson (http://www.ted.com/talks/michael_nielsen_open_science_now.html) discusses an extremely difficult physics problem that was solved through online colloboration in blog comments. It was a highly successful experiment on the part of the principal investigator.